The Kawhi Leonard trade saga has so far been short on specific news about the possibly still-injured Spurs forward’s future home, though the Lakers are supposedly the California native’s preferred destination. But it’s getting long on ridiculously specific media reports, which is really what’s necessary in the NBA offseason. 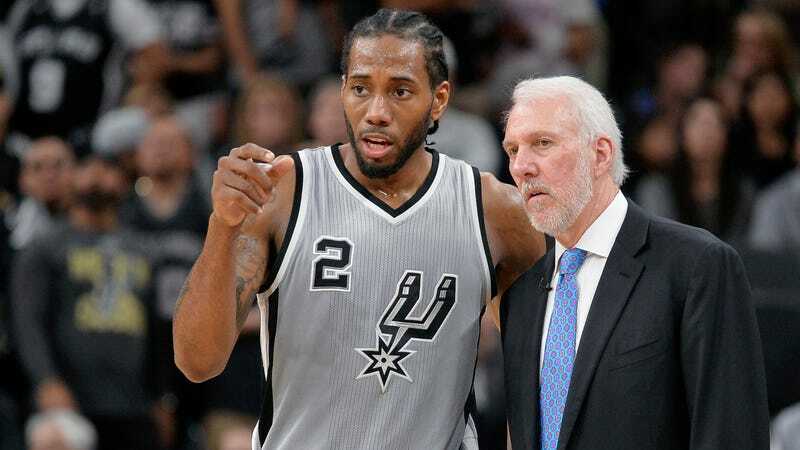 Initially, there was the announcement of Leonard’s trade request, which came via simultaneous “league sources” reports from three different NBA reporters who were very possibly on the receiving end of the same mass text from the player’s agent. But tonight, we were treated to something even more exciting: the slow trickle of information about a meeting between a coach and a player that may or may not have already happened. Eleven minutes later, Yahoo Sports’s Shams Charania one-upped his former mentor’s report by saying that the meeting was not just in SoCal, but in San Diego specifically, and also that it had already happened. Stay tuned for updates as this situation develops. Perhaps one of them will confirm that Kawhi both inhaled and exhaled during the meeting.